Yes, by all means, go ahead and buy that ridiculously expensive cat bed you saw at the store the other day. After all, you like it and the charming lady there insists that this cat bed is “purrfect” (insert sound of teeth grinding) for your feline friends. But here’s the thing: No matter how hard you try, no matter how much money you spend – as soon as something is labeled “for the cat” the cat won’t use it. The exception to the rule are feeding bowls. With some nice rigorous training sessions involving a water pistol, and a few weeks time, any cat can learn that feeding from the bowl on the floor is much easier than from the plate on the table. Also the fur stays dry. Cats prefer it that way. Coming back to that cat bed. There it sits, cute, pretty, soft, warm and inviting. Expensive, too. “Purrfection” (teeth grinding). But then only the best is good enough for a pampered cat. And the cat? Is upstairs in the office, sprawling in her new favorite place. Approach to remedy the situation and you get the “stank eye”. Never leave a bag of shredded paper unattended for more than 30 seconds if cats are around. A cat grows an extra set of legs complete with claws when one tries to remove it from a bag of shredded paper. A cat resting on a bag of shredded paper purrs. 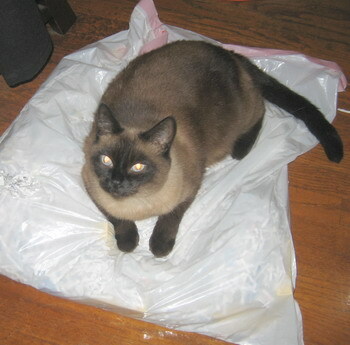 A cat will never rest on a bag of shredded paper you put into the new cat bed. It’s just no fun. Learn to live with a bag of shredded paper on your office floor. After all, is there anything more comforting than a perfectly happy and contented cat? Oh, yes, I’m familiar with the cats’ loathing of objects in direct proportion to how much said object costs and it’s opposite corollary, cats’ preference for packaging said expensive object was packed in. I recently spent well over $100 on “cat enrichment toys”. Cats totally ignored all but one. At this moment, I have a bright, cute “cat tunnel” in the dining room that’s pining away for feline company. But put a box or bag or garbage can lid in the floor, and voila, instant cat. Such purrrrverse creatures. But we love them so. Only love of the silky creatures makes their antics bearable. How else can one survive without going postal? Ist that a photo of your kitty? Beautiful creature. What’s his/her name? If you want to meet her minion, go to the entry from October 25th. Juliette (or Julchen, that’s German) is known as “The Black Shadow” for a reason. Wow, a minion. The only minions my cats have are us. Both your kitties are beautiful. May I return the compliment? Ginger and Red are quite the pair, very beautiful. By the way, today is “International Julchen Day,” for very obvious reasons. She’s been hanging out at the window all day already, to celebrate her special day.